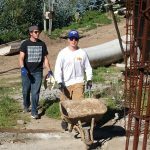 One of the hallmarks of McQuaid Jesuit is the Service Immersion Trip Program. As a Catholic Jesuit school, our mission to educate young men includes service to others and a commitment to justice. Our service immersion trips seek to encapsulate both of these important aspects by serving communities in need and challenging our students to think critically about how we are all called to work towards a more just world where the human dignity of every person is fully recognized. Respect: Students will respect their fellow students and chaperones. They will show respect to our hosts and the people of the communities we are guests in. 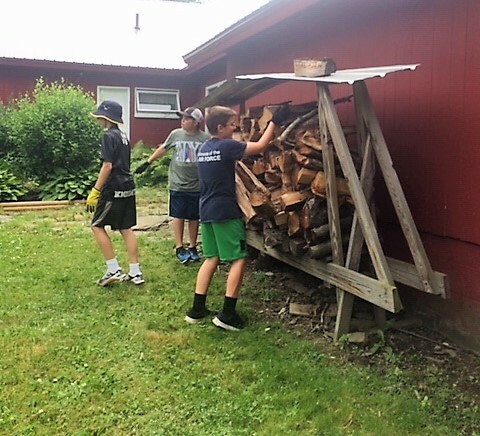 Hard Work: A service trip is not a vacation, students should be prepared to work hard and take initiative at our service sites. Community: While on the trip, students will be living in community and sharing certain tasks like preparing meals and cleaning up. These tasks should be shared equally and students should understand their actions affect everyone else in the group. Reflections: the reflections on issues of social justice and Catholic Social Teaching are an integral part of all service trips. Be Present: Cell phones and other technology will not be allowed for most of the trip. This is to encourage students to be fully present in all aspects of the experience. In preparation for their trip, students will have mandatory pre-trip meetings. At these meetings students will further share and discuss their motivations for serving others, what is means to be “committed to justice,” and learn about the communities we are going to serve. What is the Working Boys Center? The Working Boys’ Center, also known as The Center for Working Families, is a Jesuit ministry located in Quito, Ecuador. Founded in 1964, the Center’s original mission focused on the educational needs of shoe shine boys working on the streets of the Ecuadorian capitol. Soon afterward, the program was expanded to include the entire family and the Working Boys’ Center was born. Since its inception, the Center’s overarching objective has been to eliminate poverty among working children and their families. To date, over 6,000 families or around 30,000 people have left poverty forever as a result of the Center’s programs. The Working Boys’ Center focuses on strengthening and uplifting the whole family as a means to fight poverty. Their holistic program offers education programs, health care, and job training to name a few of their services. The Center also assists families in starting new businesses and in building their homes. In the more than fifty years the Center has operated they have assisted over 6,000 families totaling over 30,000 individuals to escape poverty. What do McQuaid Jesuit students do? 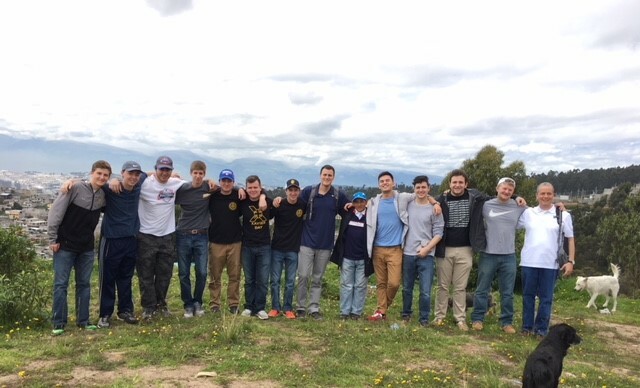 McQuaid Jesuit students will get a full immersion experience while spending a week working along side the people of Quito. Students will get many hands-on experiences at the Working Boys Center through touring the facilities, helping prepare lunch for the students, learning about the trade skills program by shadowing older students, and celebrating Mass at the Center. On one of the final days of the trip McQuaid students engage in a “minga” or work day. They assist in building a home for a family that is helped by the Center. Ecuador has a vibrant history and culture that students will learn about throughout the trip. There will be a tour of the historic city center including sights such as the presidential palace and Quito’s most well-known Jesuit church, the Compania de Jesus. Otovalo Market is one of the most well-known markets in South American and students will get a chance to see the work of local artisans and vendors and barter with them on a day trip to this small town North of Quito. Other opportunities to learn about Ecuador and its people include visiting the homes of families served by the Center and seeing El Mitad del Mundo, the center of the world equator monument. To actually see what a trip to the Center and Quito looks like you can watch this video put together by Le Moyne College students. What are our living arrangements? 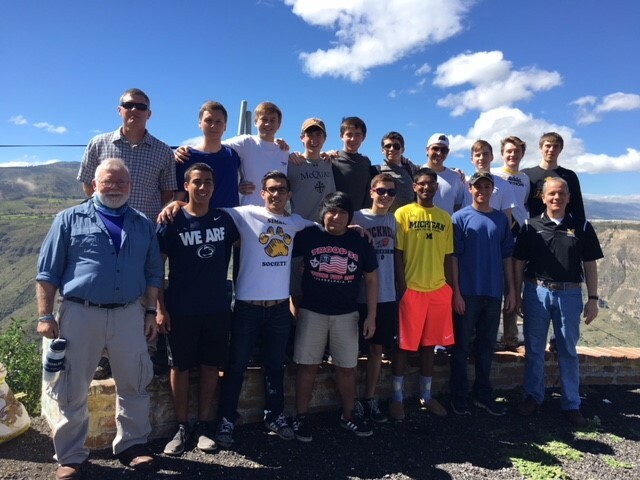 McQuaid Jesuit students who serve at the Working Boys’ Center live with other volunteers in the “Volunteer Center.” The residence houses year-long as well as short-term volunteers and their chaperones. Students live in traditional dorm rooms with three other classmates. Each room has four bunk beds, a bathroom and shower. The staff of the Volunteer Center provides food for breakfast and lunch, and they prepare dinners five nights a week. The staff also ensures potable water is available to all volunteers. How do we prepare for the experience? Since students on the Ecuador trip are traveling to a developing nation some extra steps to prepare for the experience are needed. McQuaid Jesuit abides by the Center for Disease Control’s advisement that travelers to Ecuador receive vaccinations for Hepatitis A, Hepatitis B, Tetanus, and Typhoid. For more information on staying healthy while traveling abroad, click here. Please wait to make vaccination arrangements until after our first orientation meeting. Students will need a valid passport to travel to Ecuador. Students accepted onto the Ecuador trip and are without a passport should apply for one immediately. While internet and phone access is available at the Center, students will not have access to their personal mobile devices. All communication will be made through the chaperones, and emergency contact information will be provided. In addition, chaperones will communicate daily to parents through email and other social media. What is the Appalachia Institute? Appalachia is a 205,000 square mile region centering on the Appalachian Mountains from Southern New York to Northern Mississippi. It includes all of West Virginia and parts of 12 other states. Almost half of the region’s population is rural, compared with 20% of the national population. While in Appalachia McQuaid Jesuit partners with The Appalachian Institute at Wheeling Jesuit University (AI). The AI’s mission is to promote “research, service, and advocacy for and with the people of Appalachia to build healthier, stronger, and more sustainable communities.” The Institute is rooted in Jesuit tradition and seeks increase awareness about issues that relate to the Appalachian region including public health, environmental degradation, poverty, and job loss . 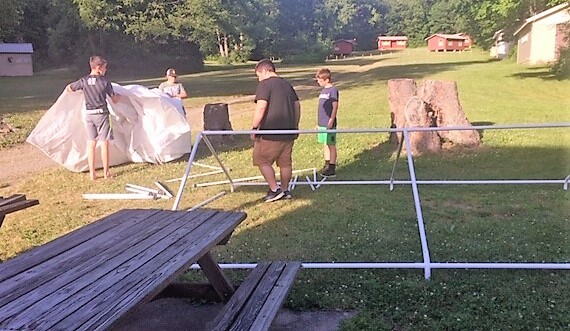 To implement its mission, the Appalachian Institute coordinates service learning and immersion trips for high school and college groups from around the country. 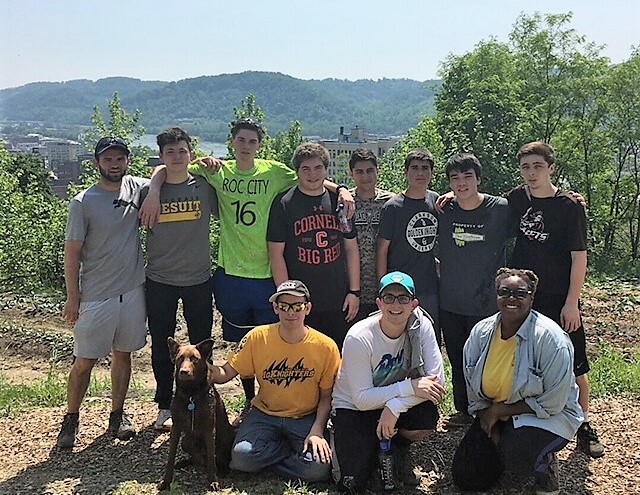 McQuaid Jesuit students travel to Wheeling, West Virginia, to participate in the AI’s week long Direct Service Immersion Program. The group will partner with organizations in the Wheeling area and possibly in another more rural community. The types of service could include home repair projects, serving meals in a soup kitchen, helping at an after school program for children, or working on a local, organic farm cooperative to name a few. 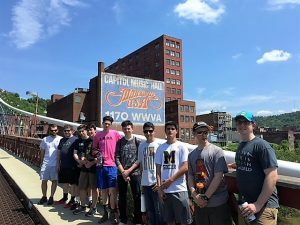 In addition to service, students will also learn about West Virginia’s history through a tour of historic downtown Wheeling and a musical program about the history of the labor movement in Appalachia. 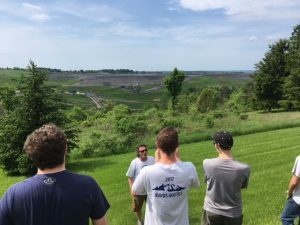 They will also get to see first hand some of the devastating environmental impacts of coal mining and refining by visiting coal extraction sites. Students live in simple bunkhouse-style quarters arranged by the AI. As on other service trips, students will live in community and share responsibilities of cooking meals and cleaning. The housing in West Virginia is fairly modest so there is a natural focus on strengthening the community of students on the trip. What is St. Anne's Mission? St. Anne’s Mission is a Franciscan ministry in Klagetoh, Arizona and on the Navajo Nation approximately halfway between Albuquerque, New Mexico and Flagstaff, Arizona. In addition to serving as a Roman Catholic parish, St. Anne’s Mission provides a variety of outreach ministries to the Navajo people, including basic home repairs, programming and education for children, a nutrition assistance program, and services for the elderly. The Navajo Reservation is the most expansive Native American reservation in the United States, covering an area larger than Rhode Island, Connecticut, Massachusetts, and New Hampshire combined. It is also home to some of the poorest people in the country with about 40% of the population living below the poverty line. The Navajo people face many additional challenges such as scarce employment opportunities, lack of basic modern necessities like running water, high rates of disease, and of course isolation in a vast rural landscape. The Mission welcomes volunteer groups of schools, universities, and parishes that support its programming throughout the year. McQuaid Jesuit typically works at the Mission for ten or eleven days in mid-July. 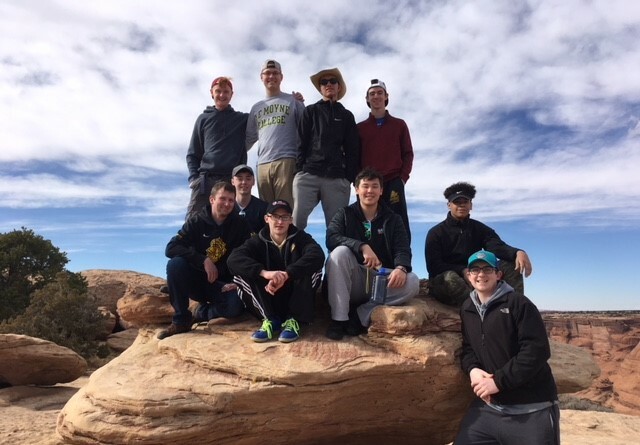 This past February, a group of students embarked on the first McQuaid Jesuit winter break service trip to the Navajo Nation for a week of service and learning from the Navajo people. More information is at www.klagetoh.org. St. Anne’s Mission typically engages high school groups in a variety of home repair projects. These projects can vary from roofing homes to repairing fences or splitting wood. 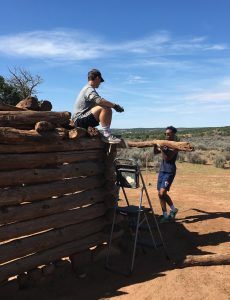 Students often are volunteering at the homes of elderly Navajo people who can no longer engage in more labor-intensive work. The projects inevitably bring students into contact with these Navajo families, who will frequently take time to share their stories and answer questions. With a large population of young children in the area, St. Anne Mission also sponsors activities for them, including trips to swim at a local reservoir and nightly romps on the Mission’s playground. Basketball is the most popular sport on the reservation and this brings groups of local teenagers to the Mission’s court almost every night looking to play. 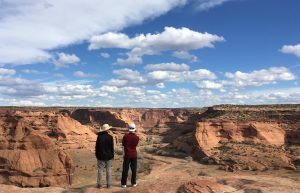 Aside from encountering the local community through service and sport, students will have opportunities to learn about the Navajo people and the southwest through trips to places such as Canyon de Chelly National Monument or Grand Canyon National Park. Our group will also get to participate in an authentic Navajo sweat lodge and possibly witness some traditional Pueblo Indian Dances. Our work at St. Anne Mission is accompanied by regular reflection, drawing on scripture, the Native American tradition, and Ignatian spirituality. Students are challenged to look inward and examine their strengths and weaknesses in the context of encountering and accompanying the poor. Students live in simple, dorm-style housing while staying at St. Anne Mission. Meals are shared, and students assist with food preparation. Depending on the trip itinerary, the group may camp out for a couple nights at a state or national park. Students do not have access to personal electronic devices during the trip. Faculty leaders maintain daily communication with parents via email and text messages. Due to the isolated nature of the region, cellular coverage in northeast Arizona is limited, but the Mission has reliable wifi and a landline. What is the St. Vincent De Paul Young Adult Center? The St. Vincent De Paul Center is located in the historic North Philly neighborhood of Germantown. 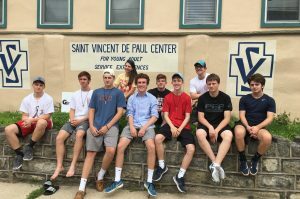 Founded in 2000 by the Vincentians it is currently run by the Daughters of Charity and offers urban service immersion experiences to high school and college students. Although no longer run by the Vincentians, the Center’s mission and programming are still rooted in Vincentian Spirituality. This type of spirituality places a special focus on serving the poor and seeing Christ in them. While Philly is one of America’s most iconic cities it is also one of the poorest. About 25% of the city’s population lives in poverty, and half of those people experience deep poverty (living at half of federal poverty line). The Center invites groups in to encounter those on the margins and be in kinship with them. 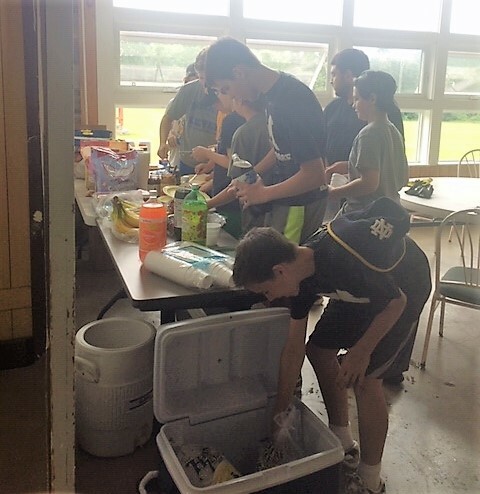 While at the Center McQuaid Jesuit students will get the opportunity to participate in a variety of different service opportunities. 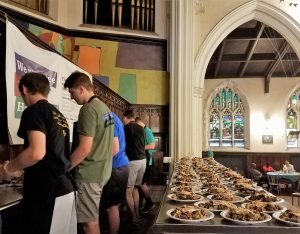 Places students have volunteered include soup kitchens (picture to the left shows students preparing to serve lunch at Broad Street Ministry), centers for the elderly and individuals with disabilities, and summer camps for young children to name a few. To learn more about the Germantown community, groups will be taken on a walking tour of the surrounding neighborhoods to learn about the history and culture of a unique part of Philadelphia. Students will also participate in morning and afternoon reflections run by the Center’s staff. These reflections include prayer and discussions around topics of bias, poverty, and mass incarceration. Aside from seeing Germantown, students will get the opportunity to see some popular Philadelphia sights such as the Rocky Steps and city hall, visit our fellow Jesuit school, St. Joe’s Prep, and of course get an authentic Philly cheesesteak. The Center is one large house and students will have cozy accommodations in a dorm-style setting. All meals are eaten together and students help with preparation and clean-up as part of living in community. What is the Urban Plunge? Urban Plunge is a weekend opportunity for juniors that usually takes place during second semester. This unique service immersion trip offers an opportunity to better understand the experience of the marginalized in the City of Rochester. The weekend is sponsored and run by the Sisters of St. Joseph Volunteer Corp.
Students spend the weekend at the Sisters of St. Joseph house near St. Boniface in Rochester. The retreat begins Friday evening and runs until Sunday morning. Throughout the weekend students will have the opportunity to volunteer at a Rochester-area charity, build community with their classmates, and reflect on values of service and justice. This trip is usually run in conjunction with Our Lady of Mercy High School so McQuaid students will also get the chance to meet students from their sister school. The weekend includes a Mass celebrated at the Sisters of St. Joseph House and engage in an interactive presentation on Catholic Social Teaching. While staying at the Sisters of St. Joseph house dinner is provided on Friday and Saturday nights and breakfast is served on Saturday and Sunday mornings. Lunch will be provided to students at their service sites on Saturday. Accommodations for students are bunk-style rooms. Students do not have access to personal electronic devices during the weekend activities. Faculty leaders will maintain daily communication with parents via email and text messages. 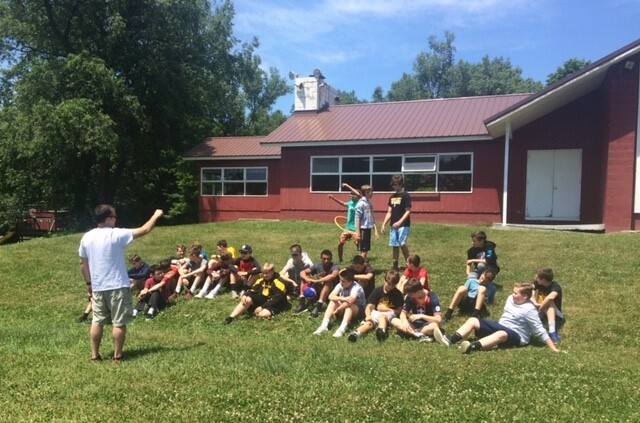 Camp Koinonia is nestled in Italy Valley, in the heart of the Finger Lakes region of Upstate New York. It is a place of exceptional beauty and natural ruggedness. Every direction offers a breathtaking view of God’s handiwork. The rolling hills surrounding the valley create complete privacy from the outside world. 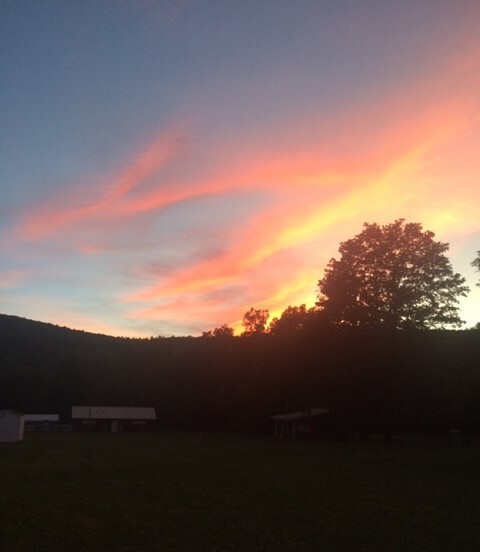 Camp Koinonia is the perfect place for reflection on some of God’s greatest creations – nature and family! This trip is open students who have just completed 7th, 8th, and 9th grade. It takes place in late June after classes and exams have ended. This an introduction to overnight retreats and service experiences for younger students. You can see pictures from previous trips above! This service trip will be a combination of service work and a summer camp experience. The days will be spent doing maintenance work for the camp: painting, roofing cabins, building a walkway for the chapel, etc. 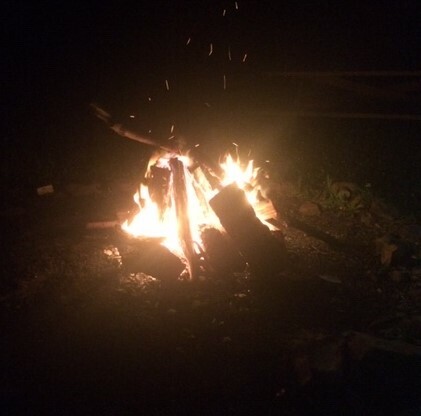 The evening programming will include skits, reflection, prayer, and a bonfire. We will also have free time for playing sports and games. 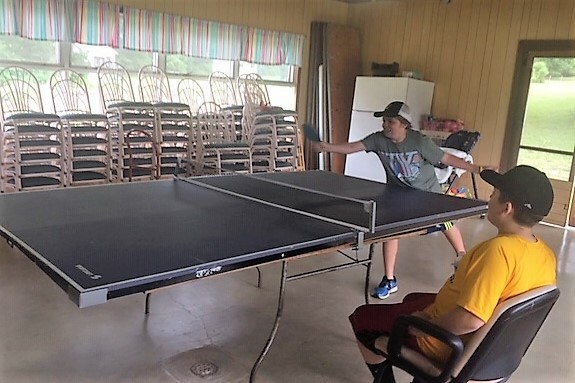 Camp Koinonia provides students with the opportunity to embody the mission of McQuaid Jesuit to be “men for and with others.” By enjoying a summer camp experience that is prayerful, productive, and a lot of fun, students are able to deepen friendships with fellow students. Additionally, students will earn 12 service hours for this trip that can help fulfill their middle school or Freshman theme requirements. Most importantly, students have an opportunity to serve God and live out the Gospel values. Students live in simple bunkhouse-style cabins. 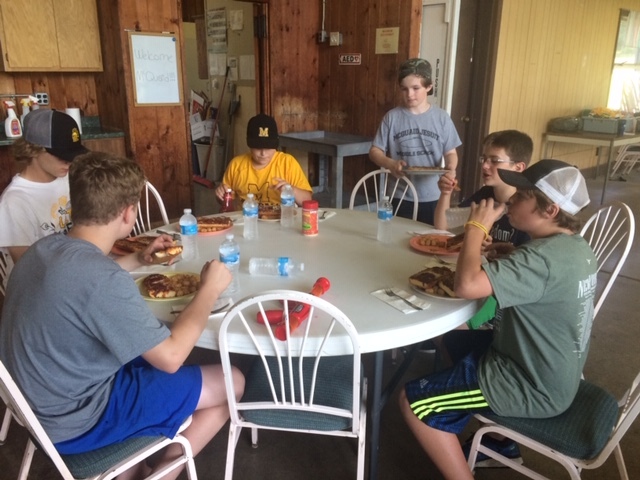 Meals are shared and provided by Camp Koinonia staff. The cost of the trip covers food and lodging. Students will not have access to personal electronic devices during the trip. Faculty leaders will maintain any necessary communication with parents via email and text messages. 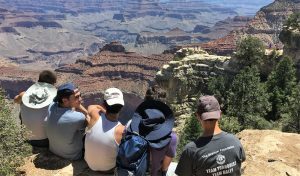 Each year McQuaid Jesuit hopes to improve its service immersion program and continue offering a diverse array of experiences to students. Students interested in participating in a service immersion trip should attend an information session in October. Trip applications will be available at the information sessions, and in Campus Ministry, and the application deadline will be in late October or early November. Students will find out the trip they have been accepted for by mid-November. If you have any questions about the service immersion program or any of the service trips please contact Mr. Flaherty.